With my job now taking up most of my time, a lot of my hobbies have had to fall by the wayside. I’ve been able to keep up with a few of my favorites, obviously including video games and writing, but I haven’t had the time to do a lot of the things I used to really enjoy. One such activity that I regret neglecting is playing music. 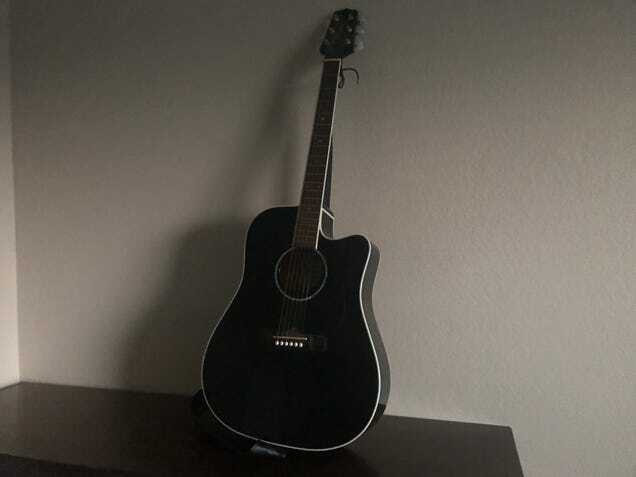 I haven’t picked up my guitar for a serious practice session in a very long time, and even when I did play consistently my skills were pretty stagnant. I’d play a few of the songs that I’ve written, or some covers I knew particularly well, and that would be it. Those songs didn’t challenge me, but they gave me a substantial amount of comfort. They made me feel like I was good at something. Recently, I’ve been inspired to swallow that unearned pride and actually try to get better at the instrument. I’ll be damned if it isn’t the most fun I’ve had with it in a while. The spark for this change of heart was my younger brother. He recently picked up the guitar, and he’s already surpassed me in a lot of ways. I could make the excuse that we’re playing very different kinds of music, he’s learning the lead parts to metal songs while I’m usually more of a folk/country rhythm and vocals kind of guy, but the temptation to make that excuse led me to a realization. I don’t want to learn that kind of music because I’m scared that I can’t. I’ve built up my meager skills in my mind as a part of my identity, and I don’t want to bear the shame of being bad at the instrument again. So this weekend I began to shake off the weight of my pride and learn his favorite song: “Enter Sandman” by Metallica. It’s a pretty easy song to learn, but it requires a lot of skills that I haven’t used in forever. Using my left hand for anything but chords or my right for anything but strumming is beyond the scope of my abilities, so building new(ish) skills up almost from scratch has been a challenge. That’s what’s been so fun though. Gradually working my way through the song and seeing tangible improvements gives me a unique satisfaction that I now realize my life has been lacking. I forgot how good it feels to practice something. Probably the last time I focused on improving a specific skill was when I was really into Super Smash Bros. Every day I would play against my friend (good old EpicRaids), and we would both work on the various obscure techniques that all the professionals used. L-Cancelling, SHFFLing, and wavedashing (alright I never got the hang of that last one) were all steps on the road to improving at the game. Practice, even when applied to a game, becomes a game in and of itself. A metagame, if you will. It’s a similar sensation to leveling a character in an RPG, only more personal. It’s anything but easy, trust me. Despite often being associated with repetition or boredom, practicing a skill can be fun. It can be hard to remember to enjoy the journey after reaching what you thought to be the destination, but it’s important to strive for improvement no matter how good you think you are. Because, if you’re anything like me, you probably weren’t all that great to begin with. How about you guys? What’s something you’ve been practicing lately?